Will buyers be proud of My First Home? Last week, the Government officially launched My First Home Scheme targeted at young working Malaysians earning RM3,000 or less to help them become home owners. Though different in many ways from Singapore's Housing Development Board scheme, Malaysia's My First Home scheme has similar and noble objectives. Malaysia has another housing scheme targeted at the poor and needy the low-cost housing scheme. It is mandatory for developers to provide this form of housing when they build and develop a township. One may ask, what has the low-cost housing scheme got to do with the My First Home Scheme? The three key words here are management, quality and standards. Granted, low-cost housing is priced between RM35,000 and RM42,000 each. Because of that price, many of these units are small, at 650 sq ft or slightly bigger and are occupied by a family of five or six. The lack of space and privacy results in children spending their time at corridors, on the landings of fire escapes or at the car park bays provided. As a result, when the owners are able to afford it, they move out in search of a better standard of living and rent out the place. This latest scheme launched a week ago involves houses priced 4-5 times that of low-cost homes. A couple of developers have already announced that they will build apartments for first-time house buyers. Although it is not mandatory for developers to provide this form of housing, they want to move into this market because they see the huge demand as property prices continue to rise. At the price of between RM100,000 and RM220,000, most of these projects will be outside the Klang Valley, or on the fringes of what will be known as Greater Kuala Lumpur. With inflationary pressures to contend with, and profit being the main motive of private developers, it is extremely important that this form of housing although not low-cost does not one day become the disenchantment of what will be Greater KL, like how most of the low-cost housing in the city have turned out today. Other than a decent minimum built-up (not 650 sq ft please! ), there should be some quality control, not only in what will one day be Greater KL, but also in other states. The cap on prices sieves out some of the more desirable locations in the Klang Valley that developers can build on because of high land prices. Nevertheless, there are two other points that are equally important location and accessibility. In the Klang Valley, some of the locations where young Malaysians can opt for include certain parts of Seri Kembangan and Puchong, as highlighted recently. In Perak, Johor and other states, the choices would be greater and in all likelihood may include single-storey houses. Whether in the Klang Valley or outside, there are lessons to be learnt from both our low-cost housing scheme and the Singapore example. There is talk that because it is a government-initiated scheme, this latest housing scheme may be implemented in the Sg Buloh land that will soon be developed. Just as developers had to do national duty with low-cost housing, could it be possible that those who eventually benefit from the 3,300 acres in Sg Buloh may also have to do some form of national duty? Assistant news editor Thean Lee Cheng hopes the My First Home Scheme will go beyond its fundamental objective of enabling the populace to own houses by including meaningful elements such as quality and good living. 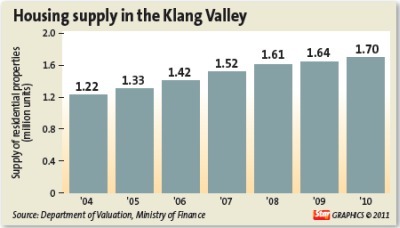 ALTHOUGH the demand for residential properties in the Klang Valley is expected to remain good this year, property consultants expect prices of landed housing to show only moderate increases compare with the double-digit jump in 2010. Landed property prices grew strongly last year, up by as much as 20% in some areas. This can be attributed to the limited new supply, which only increased by 3% during the year, which was less than half of the 6%-8% annual growth seen during 2004-2008. Strong buying interest and economic performance data last year led to many new project launches last year after being deferred following the global financial crisis. The increase in project launches is also due to higher confidence in demand and take-up rate. Many of these projects will be completed this year and add to the supply numbers. “Such high prices are not sustainable as there will be a limit to how much they can go up. Ultimately the question of affordability and sustainability will kick in,” Koh says. Concurring with Koh, Knight Frank Ooi & Zaharin Sdn Bhd managing director Eric Ooi expects prices of landed housing to show modest increases averaging between 5% and 10% these one to two years. This is in line with the expected slower growth in the country's gross domestic product of 5% to 6% this year from an expansion of 7.1% last year. “Such increases are healthier and more sustainable for the market. I believe it is one of the effects of Bank Negara's measure that capped the loan-to-value ratio (LVR) at 70% for the third mortgage borrower. It is a good measure to curb speculation in the market,” Ooi says. The move is seen as a measure to reduce speculative activities and prevent the housing market from overheating as the economy recovers amid a low interest rate environment. Ooi says market sentiment is still generally healthy with demand strongest for terrace houses priced from RM300,000 to RM1mil. CB Richard Ellis managing director Allan Soo says the high prices of landed houses have made affordability a serious issue, especially among first-time house buyers. He says the market preference appears to be for smaller units with lowerentry costs. Soo says the proposed mass rapid transit (MRT) system augurs well for the market and hopefully there will be more affordable housing projects to meet the needs of the people. “Developers have already started formulating plans for property developments near the various stations, which should be a major driver for new projects over the next two years,” he adds. He concurs that the LVR measure has contributed towards curbing speculative buying in the market, notably the medium-high to high-end price range of up to RM3mil. On overseas investment, he says the strong ringgit over other major currencies has made owning property overseas a more viable proposition for those looking to spread their investment portfolio outside the country. “Malaysians are venturing overseas and the popular countries include Singapore, the United Kingdom and Australia,” he adds. Meanwhile, a recent survey by Real Estate & Housing Developers' Association reveals that average prices of newly developed residential property are expected to grow by 13% this year over last year's as a result of rising raw material prices. The survey found that houses in the RM100,001 to RM500,000 price bracket are the most sellable, while demand for residences priced between RM250,000 and RM500,000 will remain strong in the next six months. DTZ's Koh says strong demand exists for smaller, starter homes priced at up to RM300,000. “Although there is good demand for such housing units, this end of the market is not being properly served and there is still a short supply,” he adds. Echoing his view, Ooi of Knight Frank says that in the KLCC area, there is also keen interest for smaller residences of about 700 sq ft to 1,500 sq ft priced from RM500,000 to RM1mil. In its latest research report, Knight Frank Research says projects which offer smaller units, such as M-Suites and The Elements@Ampang are well received by the market with sales rates of more than 80% due to their lower entry prices and ease in future leasing. The high-end condominium segment has a cautious near-term outlook following the imposition of the 70% LVR cap on third mortgages. Some 1,202 units of high-end condominiums will be launched this year. Kuala Lumpur suburbs will see more launches including MK 20 and MK 28 by Sunrise Bhd, while SP Setia's KL Eco City is also in the pipeline. Others include sixceylon by Bolton Bhd and JSI Serviced Condominiums by UDA Holdings. 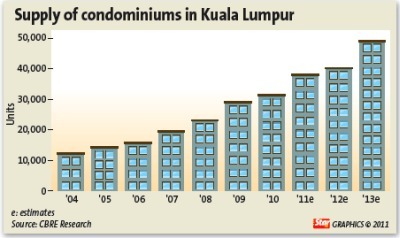 According to Knight Frank Research, within the first half of this year, 1,692 units are scheduled for completion in the city centre of Kuala Lumpur and a further 2,020 units will be in the fringe areas of KL. Some of the notable projects include Panorama, Swiss Garden Residences, Regalia@Sultan Ismail in KL city; Gallery@U-Thant, Damai 206@ Embassy Row and Brunsfield Embassyview in Ampang Hilir / U-Thant; D'Nine, Suasana Bangsar and Gaya Bangsar in Bangsar; Seni Mont' Kiara, Kiara 3, Sunway Vivaldi and Kiara 9 in Mont' Kiara. CB Richard Ellis in its latest MarketView says the condominium sector, particularly in the KLCC area, performed more poorly last year. Some high-end projects witnessed a decline in both capital values and rents as the market consolidated after the heady growth of 2007-2009. “Of concern is the impending supply, with 2011 completions projected to be around 6,000 units, and we expect this to have an effect on the luxury residential market,” the report says.